This invaluable, easy-to-understand guide to world politics and government offers an accessible introduction to more than 80 of the most important theories and big ideas of leaders and politicians throughout history. 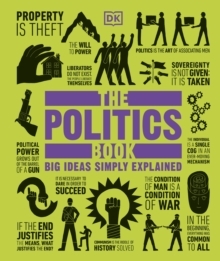 The Politics Book makes government and politics easy to understand by explaining the big ideas simply, using clear language supported by eye-catching graphics. The key events in political history are outlined from the origins of political thinking by Confucius and Aristotle to modern-day activists such as Martin Luther King and Nelson Mandela. Helpful mind maps break down their important concepts into bitesize chunks to make the subject accessible to students of politics and anyone with an interest in how government works. A handy reference section also provides a glossary of key terms and a directory of significant political figures. Filled with thought-provoking quotes from great political thinkers such as Nietzsche, Malcolm X, Karl Marx, and Mao Zedong, The Politics Book gives context to the world of government and power.